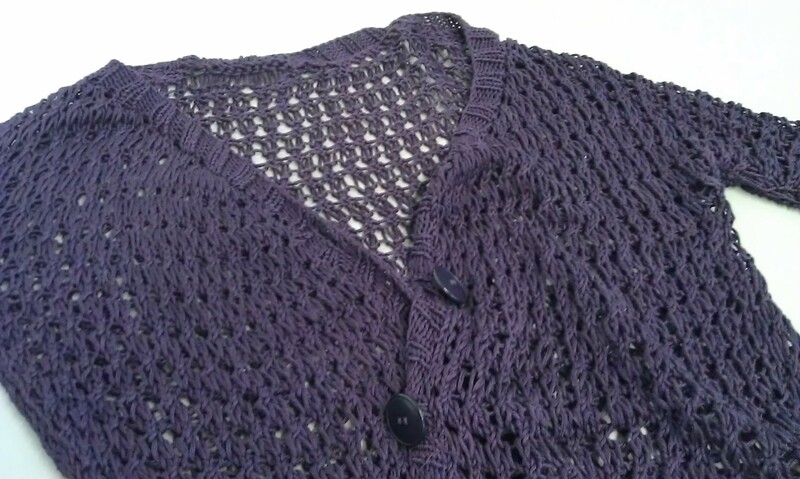 This morning it was not as sunny as yesterday and I picked up a lace cardigan made from very nice and cool egyptian cotton I had knitted last year that had been lying around waiting for some modifications to be done. The pattern I had used was suppossed to be a jumper rather than a cardigan and my modifications weren’t as successful as I wanted them to be. While the cardigan is rather a bit tight around my arms, it is super baggy around the body and then I added four cool but rather big buttons which drag the otherwise rather light and delicate cardigan down. The seem with the button holes is too tight while the button holes are too big. Listing all these faults I now realise that mere modifications won’t do. I guess I will frog it completely and reknit. I actually really like the overall lace but I really need to adapt the shape. I’m think about taking the shape of Abalone and instead of knitting in stockinette knitting the lace pattern I used before and then increasing for 3/4 long sleeves… Sounds like a lot of calculation but I guess this could work! What do you think? This entry was posted in Knitting & Crocheting and tagged Cardigan, Knitting, Pattern by kathatravelling. Bookmark the permalink.